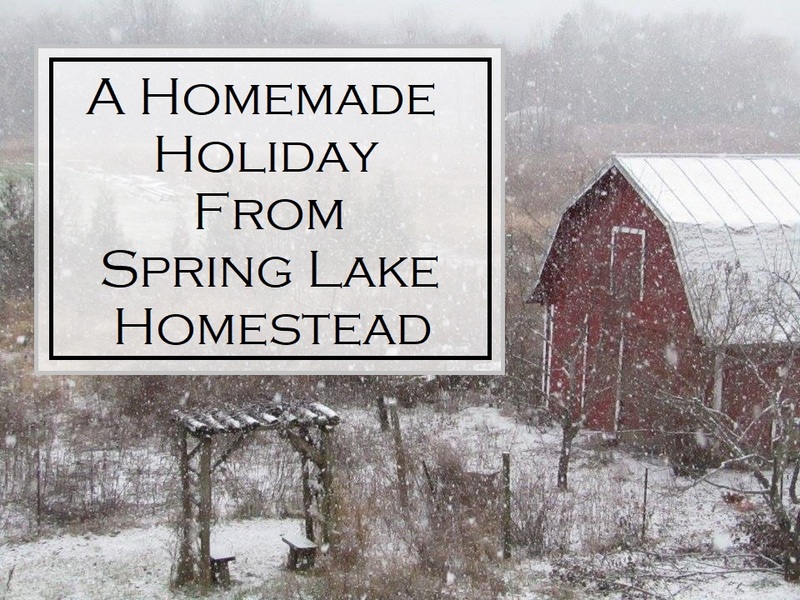 I’d like to formally invite you to A Homemade Holiday from Spring Lake Homestead! Join us from the comfort of your own home while we prepare gifts, hearts, and homes for the upcoming holiday season. In the coming weeks, we’ll be working on our holiday preparations, from gift-giving, wrapping, card-making, baking and more. This is a free “event,” but you may need to buy supplies if you do not already have them around your house. If you’d like to follow along, make sure you subscribe to the blog so that you don’t miss our latest posts (there should be a form in the sidebar or at the bottom of the page), and follow along on our Facebook page to keep up-to date! I’ve had a few people ask me recently if there is going to be a handmade Christmas gift boot camp again this year, and unfortunately there is not. I think those that participated enjoyed having a list of projects they could work on and being challenged to try new things for the first time, the support that they received from other participants, and being able to ask those who made tutorials questions if they had them. Since there is no boot camp this year, I thought I’d do my own sort of boot camp. Unfortunately, this idea just came to me, so I’m still working out details, and I don’t have a series of posts ready to publish at the push of a button (yet). So I’m going to do as much planning as I can this week, and hopefully have more details for you by the end of the week. But this is what I do know so far. We’ll be covering gifts, decorating ideas, gift wrapping, and baking, among other things, but my primary focus is going to be on gifts. We’ll be having at least one post a week until the week before Christmas, and if I’m able to, there will be more. I’m talking with a few friends, and we might end up having some guest posts as well. I’d still like to get a couple of posts up about what we’ve been working on around our homestead for the last few months, so we’ll really just have to see how things play out. I do intend to designate at least one specific day a week for posts for this series, and once I figure that out, I’ll let you know! Later this week, I am hoping to get up a post with a list of the projects that we will definitely be doing here on the blog, as well as a list of supplies you will need for each one if you plan to follow along and a list of the dates those posts will be published. If I have time for more posts, they’ll be fit in where and when I have the space and time. I’d like to do one simple building project, some crocheting, sewing, crafting, and baking. Most of these will be somewhat simple, but you might find that you do not have the supplies or tools needed for these projects, so just join in where you can and when you want to! And since we homeschool and my house is always full of kids, a lot of this will be fairly easy and kid-friendly, though not necessarily all of it. Looking for ways to get started on your holiday planning right now? Check out some of our posts from years past! If you have any questions, comments, or suggestions as I make plans, please let me know either here or on our Facebook page! And feel free to let you friends know about this once I get some more details worked out! If you are looking for projects that kids can make, may I suggest finger knitting? It’s fun, kids love it, and it is calming. You can make garlands, ropes from which to attach cards, and even use it in place of ribbon to wrap gifts. I’m open to suggestions! 🙂 Thanks for the ideas!